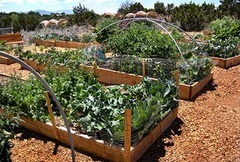 The gardening trend is here to stay as people have begun to realize the benefits of growing your own food. Beyond saving you money and tasting better, homegrown produce increases your community's sustainability. So it's no surprise that community gardens have become so popular as the gardening trend has extended out to apartment dwellers, schools, and those who simply want to garden in a shared environment. As highly visible, public spaces, community gardens also tend to become showcases for gardening best practices . In addition to composting and organics, we are just now seeing rainwater collection enter the scene. This is especially true in dense urban environments where the community garden may just be a vacant lot with no water connection or a borrowed one only. In other cases, we have seen rainwater harvesting added as a hedge against droughts and bans on the use of hoses. Meanwhile other locations add rainwater catchment as a form of education for the community. Here is the obvious opportunity for our rainwater collectors. Community gardens have a true need for standalone rainwater harvesting. Please help us spread the word.